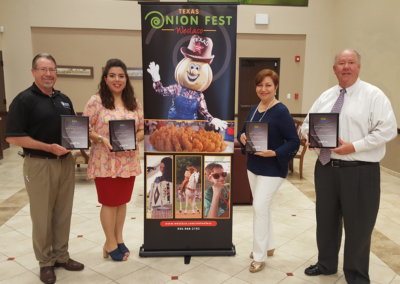 The Weslaco Area Chamber of Commerce is the recipient of seven marketing awards from the Texas Festivals and Events Association for their promotion of Texas Onion Fest. TFEA awards the marketing efforts of events and festivals across the state. CEO/Chamber President Doug Croft attended the TFEA annual conference in Fort Worth July 27-29, where he accepted the awards. Texas Onion Fest is in the category of events with budgets from $75,000 to $250,000. The festival garnered four first place awards. Winning categories are Best Single Newspaper Display Ad, Best Company Image Piece, Best Event Video and Best Radio Promotion. In addition, the festival has second place honors for Best Newspaper Insert/Supplement. It also took third place for Best Miscellaneous Multimedia as well as for Best TV Promotion. McAllen-based graphic designer Liz Gonzalez has designed all Onion Fest logos for more than 15 years. She designed both entries for Best Company Image Piece and Best Single Newspaper Display Ad.